This post has already been read 3327 times! 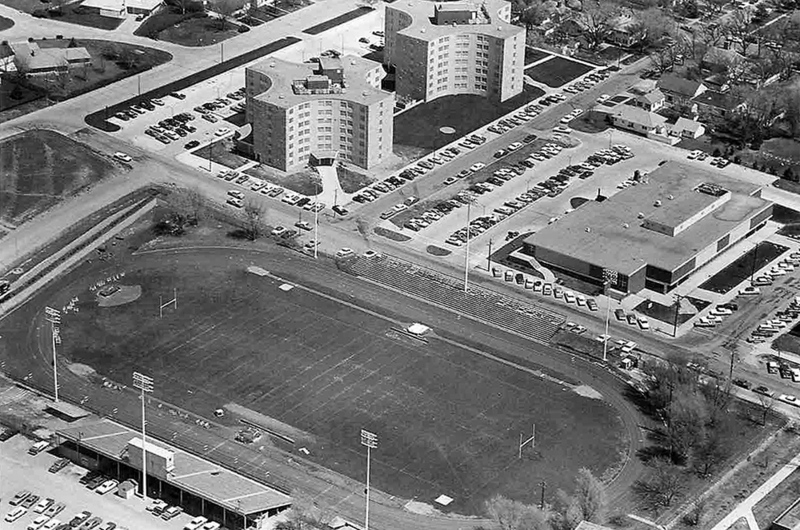 Foster Field, shown in the 1960s, moved to its current location on the UNK campus in 1939. It was 1955 or ’56. The Nebraska State Teachers College football field was filled with water and mud from four inches of rain. The field always turned into a lake whenever it rained, says former coach Al Zikmund. And it was one of the great advantages for the home team. “There was water standing out in the middle of the field. By game time it had soaked away, but I told my players we wanted to score as soon as we can,” Zikmund recalls of that 1950s game. “Well, we received the kickoff and got to the 30-yard-line. The first play we called was a dive play and our halfback, Steve Kraus, carried the ball and went ‘zing’ 70 yards for a touchdown. Gov. 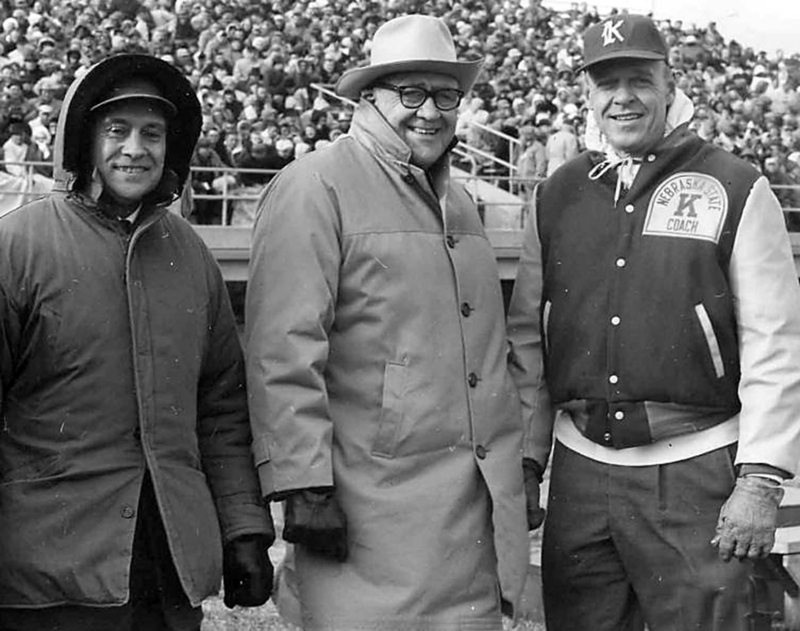 Frank Morrison, center, with Kearney State College Athletic Director Charlie Foster, left, and football coach Al Zikmund at a 1963 NAIA playoff game against Prairie View A&M of Texas. 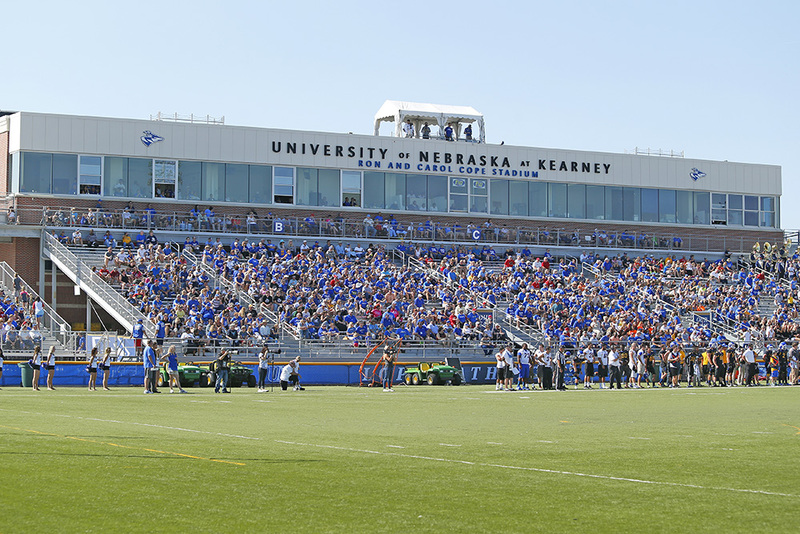 This season, the University of Nebraska at Kearney is celebrating the 75th anniversary of its football field – now known as Foster Field. Zikmund, who coached Antelopes football from 1955-71 and is a member of the Nebraska Football Hall of Fame, remembers the field as being “barren” and players and coaches always adapting to less than ideal playing conditions. “When I arrived here in 1955, Foster Field was far different than what it is today,” he says. So Zikmund, who starred at the University of Nebraska from 1939-43, called in a favor. 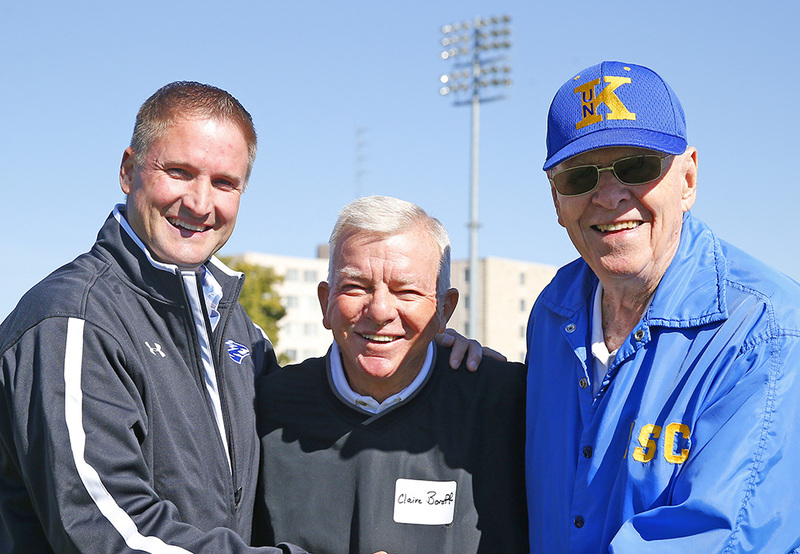 UNK Athletics Director Paul Plinske, left, recognizes former Loper coaches Claire Boroff, middle, and Al Zikmund at UNK’s Oct. 18 game against Lindenwood. In 1960, the athletic field at Nebraska State Teachers College was named Foster Field in honor of longtime coach Charlie Foster. While rough playing conditions were part of the field’s lore, there were plenty of good memories to go around. “One year for homecoming we were playing Hastings College, and we were both undefeated,” Zikmund says. At the time, Foster Field seated about 3,000 spectators. Zikmund’s memories of Foster Field are numerous. He talks about the newspaper editor who helped him get new restrooms for the field, and the game when he broke down a sheet of ice covering the playing surface with a tractor following a snowstorm. When Zikmund returns to Foster Field today, it is much different. There is all-weather playing turf and bleachers, a modern press box, VIP suites and ongoing improvements to Ron and Carol Cope Stadium and its surroundings. 1916 – The athletic field was moved to where Calvin T. Ryan Library now sits. The first fields were located where A.O. Thomas Hall is currently located and included a small set of bleachers and board fence to protect it from traffic on nearby West 24th Street. 1930 – Field moved to area southwest of 26th Street and 11th Avenue, where Cope Fountain is now located. A board fence protected the field from nearby traffic, and it also was surrounded by floodlights that made Kearney one of the first towns in the Midwest to host a night game. 1939 – What is currently known as Foster Field was completed. While the school’s first two athletic fields ran east-west, those in later years ran north-south. 1959-60 – Seating increased from 2,900 to 4,700, and a heated press box was added. In 1960, the athletic field at Nebraska State Teachers College was named Foster Field in honor of longtime coach Charlie Foster. 2005 – Upgrades to Foster Field were completed to form the three-story Ron and Carol Cope Stadium. The $7.2 million project included: installation of synthetic turf; construction of locker rooms; new sound, lighting and scoreboard systems; fencing; bleacher renovations; concession stands, restrooms and ticket booths; and a new press box with large hospitality rooms.